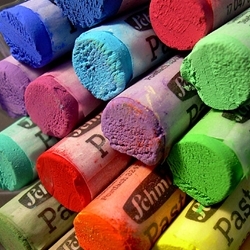 Schmincke Soft Pastels...We offer the entire range of these professional, German made soft pastels. Their extreme softness and color strength is achieved by Schmincke's very traditional formulation. Each pastel is carefully labeled by hand after the drying process has been completed. Their color range now includes 400 colors! Schmincke offers 77 pure colors and then mixes each pure color with black artist pigment for a rich, deep tone and to achieve their lighter pastel tints they also mix each pure color three 3 levels of white artist pigment, each graduation lighter than the previous mixture. To round out their line, they also offer 15 rich colors consisting of special darks, lights, metallics and 10 mixtures of white with neutral gray.